It can also be difficult to follow the text on certain pages where the flow of the dialogue bubbles are not entirely clear. This mostly happens there are multiple characters speaking, where it can also be tricky to know who is saying what. Aside from that, the use of language is sometimes very smart. When we flash back to living with humans, the human dialogue is indecipherable except for a few key words. This, again, gives us the canine perspective but it also raises an issue shared by many similar works; how can all the different animals can understand one another except for the humans? It’s interesting to see some of the comparisons that were made between Legend and other art. One comparison that appears on the front cover, is quoted inside and which the authors list as an influence is Watership Down. Aside from having animal characters, I do not really see the similarity. The same applies to comparisons with The Incredible Journey. Perhaps it depends on one’s exposure to similar works but I find it would be much better to describe it in comparison to Ginga Densetsu Weed which also contains a dog pack, a general lack of humans and a lot more examples of animal diplomacy and combat than Watership Down has. With the city setting, it reminds me of The Outlaw Varjak Paw. Although that one had a cat as the main character, we still had packs living in a city and there was a general unease between dogs and cats. In other places the influences are quite obvious. The authors have mentioned the influence of The Secret of Nimh and one of main meetings in Legend's first volume is that with a hawk who knows something no one else does. The parallel to Mrs Brisby meeting with the owl is very obvious. Sometimes there seem to be parallels but which are probably just coincidence. 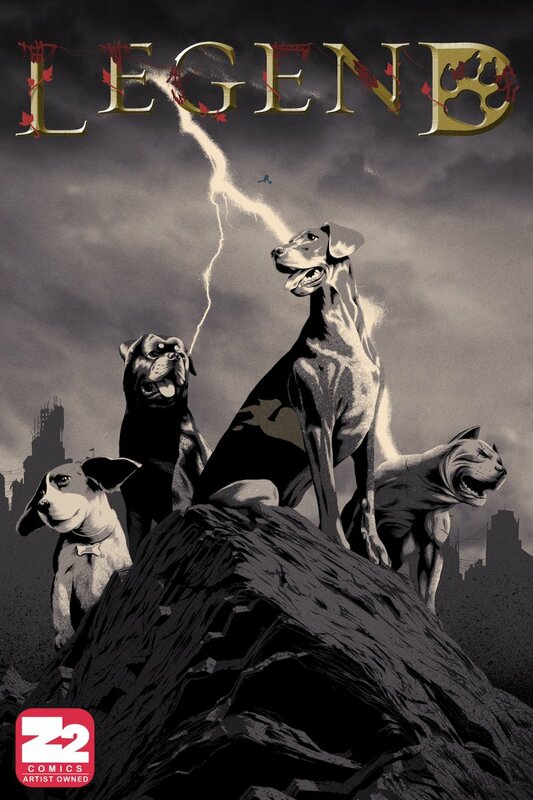 The tensions between whether humans are good or bad, played out between two dogs’ back stories, one having been used for dog fights and the other loved pet, is the same conflict that we see in the Hungarian film White God. In the end though, the allusions and comparisons do not matter. The pertinent question is whether Legend is any good or not. I will not deny that the artwork is beautiful and the world is intriguing but volume 1 only sets up a story and leaves the reader with many questions. If the story is going to continue and we will delve deeper into the mysterious shadow creature and resolve the cliffhanger this first entry ends on, then it will definitely be worth buying. Unfortunately, I was unable to find any information on when, or if, volume 2 would be released. When did "speech balloons" become "dialogue bubbles"? Or is that American vs. British? Actually I always knew them as speech bubbles but I had the term dialogue in my head and so... dialogue bubbles were born. :) According to Wikipedia my new version isn't a current variant for some reason. "Speech balloons (also speech bubbles, dialogue balloons or word balloons)..."